The Mini Switch lets you change between a low-wing and a high-wing mounting quickly and easily. Its compact size makes it easy to transport to and from the flight park without disassembling the plane. 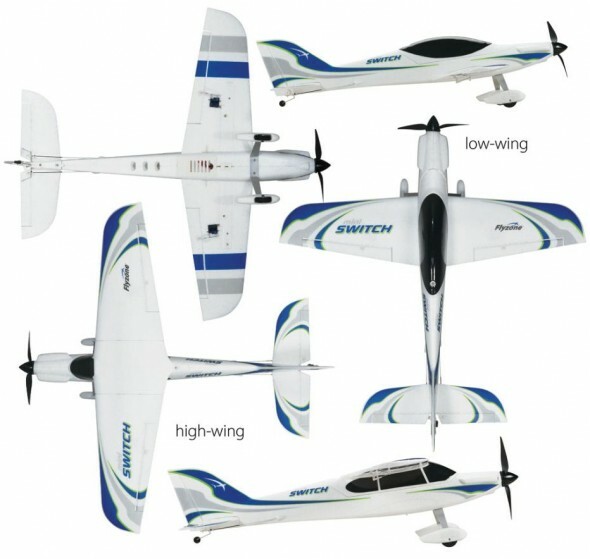 Whether in the low-wing or high-wing configuration, the Switch is a sleek model that keeps flying fun. A quick release battery hatch makes battery switches a breeze! Assembly of the tail section is designed to be quick and easy. The trim scheme on the Mini Switch is factory-applied, for eye-catching looks and convenience.